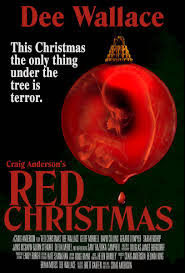 Artsploitation Films has acquired the U.S. rights from international sales agent Devilworks for the Australian horror film RED CHRISTMAS directed by veteran television director/producer Craig Anderson. The dark,violent and sickly twisted tale had its World Premiere at the Sydney Film Festival, its North American Premiere at Fantasia Festival and its European Premiere at London's Frightfest 2016. The film stars (and was co-produced by) horror film acting legend, Dee Wallace (The Hills Have Eyes, The Howling, E.T., Cujo, Critters, Halloween,The Lords of Salem) as the mother of a squabbling family, gathered together in a remote Outback estate on Christmas Eve. When a mysterious, deformed young man named Cletus appears at their door, things soon go from petty insults to bloody, imaginatively orchestrated violence as Wallace attempts to protect her family from the vengeful intruder. The film deliriously infuses comedy, dark family secrets with outlandish gore and adds the always controversial subject of abortion in its blood-stained mix. The limited theatrical run is scheduled for August and DVD/Blu-ray and VOD scheduled for October.